The Converse Blog: The Converse Blog: Breaking News....maybe....Kevin Love with Converse? The Converse Blog: Breaking News....maybe....Kevin Love with Converse? I love the NBA Draft. In fact it might be my favorite sporting event of the whole year. I can't explain my love for it, I just know that inside I look forward to this day all year long. I love even more now that Converse is back to being a major player in NBA. Last year news broke a few days before the draft that Converse had signed Alando Tucker. Then a few weeks later news surfaced that linked Acie Law to Converse. 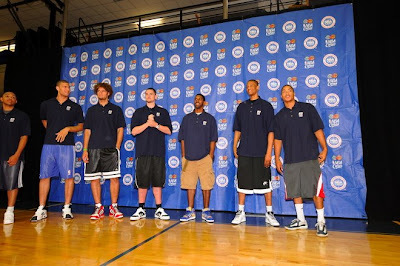 Like last year the players invited to the Green Room during the draft participated in an NBA Cares event. Also like last year many of the players wore sneakers of the brand they signed with. So I was looking forward to the pics to come out and I love what I found. In the bottom right hand corner of this picture you can see someone wearing the Converse Pro Team Black/White colorway, (for sale at Converse.com). You can't really see as well as I'd wish, but if you look at the large photo here, you will see that Kevin Love is wearing Converse. However, I don't know for sure that this means he is signed to Converse, nothing official has been released, to my knowledge. Also Derrick Rose has on some Fila casual shoes, and I am not sure Fila even makes basketball shoes anymore. So take this info at your own risk, however I feel pretty good about assuming Kevin Love is with Converse.